Makeup with Bella: Beauty acids treatments. 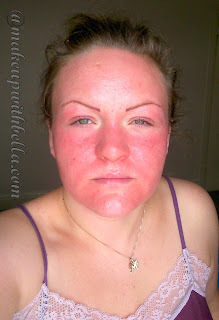 I would like to write you about the benefits of beauty treatment with acids. 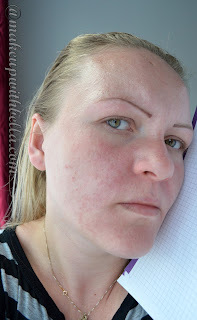 And that my face is a great field for this type of treatment: impurities, imperfections, many blackheads and pores, so I've associated with this procedure a huge hopes . Before the planned wedding day I've served up myself a series of three such treatments at monthly intervals, in order to ensure that my skin will be smooth and gorgeous on this beautiful day of my live :)! Chemical peeling are one of the most comprehensive aesthetic medicine treatments. They are used as a anti- aging prophylaxis and depigmenting treatment. Perfectly encourage the skin to renew and regenerate. In most use of the properties of natural fruit acids, but some are obtained synthetically. Type peeling, its concentration, spot and application area (face, hands, back, shoulders) are chosen depending on the individual patient's needs. The first time I've got acid 10- 06- 2015, then 08-07-2015 and the last series took place on 17-08-2015 and it was a trichloroacetic called TCA acid. TCA (trichloroacetic acid) is present in concentrations of from 10% to 50%. Depending on the desired result, the relevant concentrations of the formulation is applied in several layers. Immediately after treatment, the skin may be flushed. Then the skin turns brown and you can have a feeling of "shell" on the skin. Proper peeling begins after 2-3 days of treatment and lasts approx. 3-4 days. 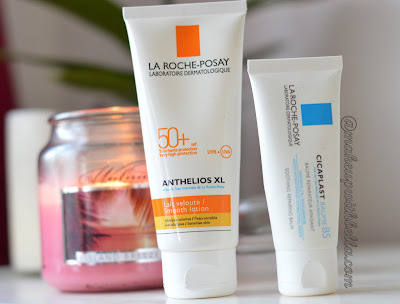 on the face I applied Cetaphil moisturizing cream, Soothing Balm Repairing and Anthelios XL 50+ La Roche- Posay, and in places heavily blistered spread Shea Butter. After about an hour of treatment, my face turned purple and started to have a feeling of tension, which persisted until the skin began to break. For me it was 3 days after surgery and lasted for 5 days, when all the whole skin peeled from face. I must admit that it didn't look aesthetically, but it would be folly tearing pendent skin. It looked like a mask peel off, so that the skin ;). My face suffered so much, experienced 3 nights in a row (though the day was ok) I couldn't sleep because of the burning and itching at the same time that without cold compresses and turned on the dryer with cold air would not be able to sleep at night :(. I was saying to myself: "why I've agreed to it?" But you know what, to be beautiful you have to suffer a little, and really it was worth it !!! All the blackheads and pimples disappeared, the visibility of pores reduced and my face wasn't shining (I have combination skin type), moreover my skin took radiance and freshness, so the effect was INCREDIBLE!!! The next day after surgery. general improvement in the appearance of the skin (other pros written at the beginning). As a result of strong cleaning can meet us unpleasant rash of pustules on the face, which means "drawn out" all the pollution of our skin. Surely you are interested in the issue of make-up in such a situation. The foundation can be applied to the face, which will even quicken skin peeling. But let me tell you that due to such a strong reaction of my skin (burning), I saw no point applying the make-up, because every few hours applied creams that soothed this unpleasant feeling. Winter is the ideal time for this type of treatment because we need to protect our skin from the sun and apply creams with strong filters, otherwise we can get a strong discolorations on the skin. Beauticians don't recommend this surgery in the summer due to the fact that not all clients follow the rules of conduct after the acids treatment and they just don't want to expose yourself to the risk of complications. To this must be approached very seriously, because you could seriously harm yourself. 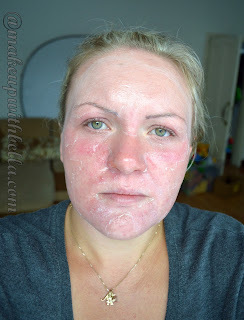 Girls, if you dream of a beautiful and smooth skin, with a clear conscience I recommend this type of peeling. It is worth to suffer a little bit, especially if you have a problem with impure skin, blackheads or discoloration. I think I've exhausted the topic, but if you have any questions, please write in the comments below or on Facebook. Or maybe any of you have similar or even different experience with acids cosmetic treatments, it will be nice to talk about this. I also invite you to meet me on: Instagram, Facebook or Tweeter. Great, extensive review. I think the results are amazing but I'm too scared of the process itself I think. Where did you have it done hun?